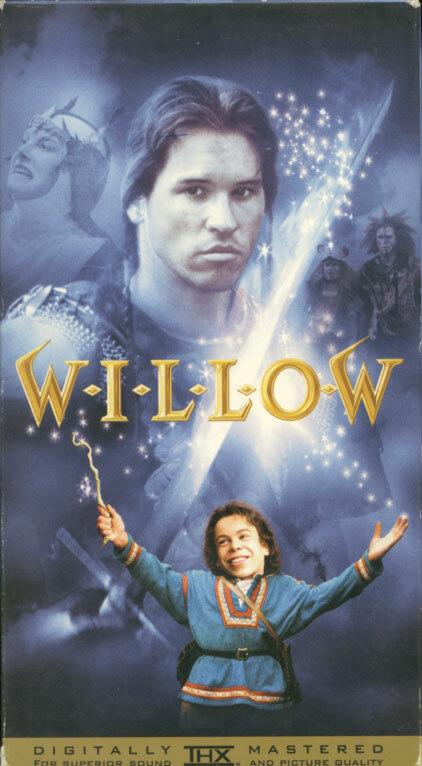 Willow on VHS. Starring Val Kilmer, Joanne Whalley, Warwick Davis, Billy Barty, Jean Marsh, Patricia Hayes. Story by George Lucas. Screenplay by Bob Dolman. Directed by Ron Howard. 1988. When young Willow Ufgood finds an abandoned baby, he is suddenly thrust into an adventure filled with magic and danger. According to an ancient prophecy, the sacred child is destined to end the reign of evil sorceress Queen Bavmorda. Now, with only a single swordsman at his side, Willow must overcome the forces of darkness that threaten to destroy anyone who stands in the Queen’s way! 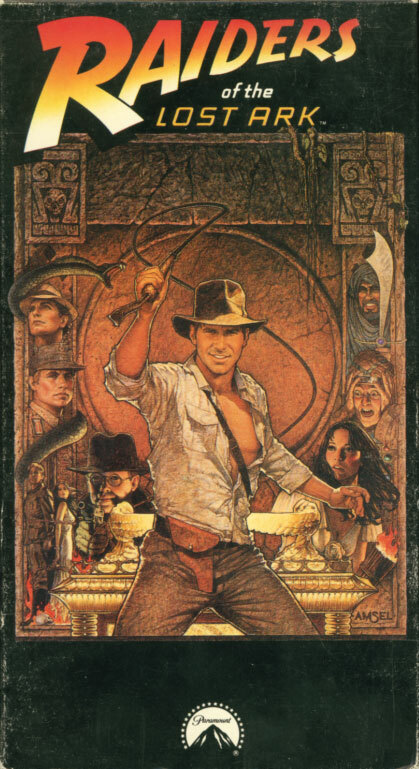 Great Movie Stunts & The Making Of Raiders of the Lost Ark on VHS. Great Movie Stunts: Starring Harrison Ford, Karen Allen, Steven Spielberg. Directed by Robert Guenette. 1981. The Making Of Raiders of the Lost Ark: Starring Harrison Ford, Karen Allen, Steven Spielberg, George Lucas, Paul Freeman, Norman Reynolds, Douglas Slocombe, Howard G. Kazanjian, Frank Marshall. Directed by Phillip Schuman. 1981. Narration by “Raiders” star Harrison Ford enlivens the “Stunts” episode, which demonstrates how major action sequences were designed and executed. “The Making Of Raiders of the Lost Ark” captures the cast and crew in the studio and on location as they tackle the many problems created by an adventure spectacular of this magnitude. Together, these two programs document the unforgettable thrills and adventures so completely that it’s almost like seeing the movie again. And what a movie! Winner of 5 Academy Awards for Best Visual Effects, Sound, Editing, Art Direction and Sound Effects Editing. 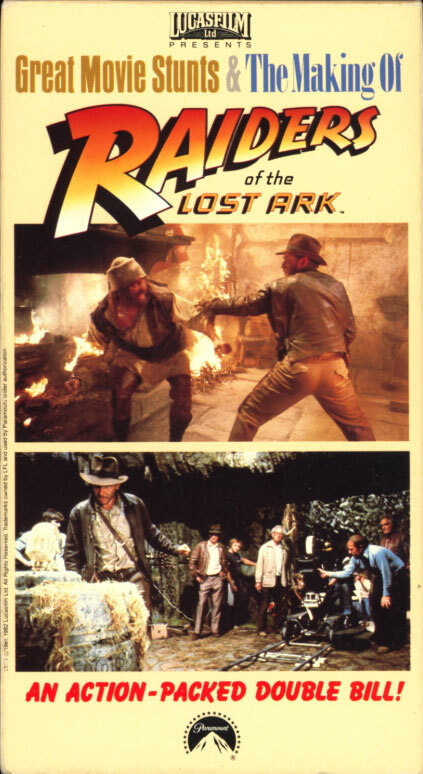 Raiders of the Lost Ark on VHS. Starring Harrison Ford, Karen Allen. With Paul Freeman, John Rhys-Davies, Wolf Kahler, Ronald Lacey, Denholm Elliott. Written by Lawrence Kasdan, George Lucas, Philip Kaufman. Directed by Steven Spielberg. 1981. This is it! Harrison Ford and filmmakers Steven Spielberg and George Lucas team in the first Indiana Jones movie — and set the whirlwind tone for Indy’s adventures to come. Here, you’ll find archaeologist Jones up to his neck in danger and — snakes alive! — up to his kneecaps in squirming reptiles. Indy hates snakes!! He hates Nazis, too, and he’ll stop at nothing to keep those goose-stepping goons from obtaining the mystical Ark of the Covenant. Hang on — and enjoy!